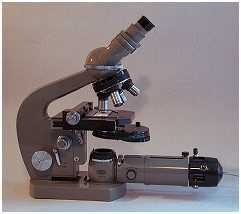 Using the Microscope: Basic Tutorial: Part 1: Introduction and Types of Microscope Stand. The Light Microscope: Optical Diagram. Introduction to the Basic Tutorial. 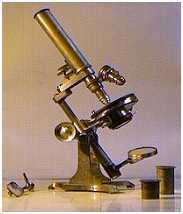 Introduction and types of microscope stand. Component parts of the microscope. Image-forming light paths through the Köhler-illuminated microscope. 6.1. Diffraction, resolution and image formation. 6.2. Refractive Index, angular aperture and N.A. 6.3. Magnification and image detail. Errors of adjustment: how to recognize and remedy them. This tutorial is for those whose work involves day-to-day use of the light microscope, as well as those approaching the instrument for the first time. It gives an easy to follow procedure for ensuring that the instrument is set up not a hundred miles from the maker's specification. It is in effect an instruction on how to set up brightfield Köhler illumination. (August Köhler, an employee of the Zeiss microscope company, proposed this method of setting up the microscope around a hundred years ago). An understanding of this simple and elegant method of illumination is a prime requirement for both routine and critical microscopy, as it underlies all the commonly encountered forms of microscope illumination -- darkfield, phase contrast, interference contrast and the various types of incident illumination -- which are covered in detail by other tutorials. The instruction is aimed at the user of the laboratory microscope. Instruments below this level may or may not have an adjustable substage condenser, and since this component is essential for satisfactory imaging, especially at the higher powers, instruments without one are not considered here (but are dealt with in the tutorial on minimal microscopy). The intention is to pass on sufficient information that microscope users may better understand their instrument, set it up in a way that produces a satisfactory image in a comfortable setting, and proceed with their work. Those aspiring to aficionado status in critical microscopy and to the use of the microscope as a source of pleasure in itself should proceed to the Advanced Tutorials. Even though the outward appearance of the microscope has changed greatly over the last century or so, the purpose of the design has not. The function of the microscope stand has always been to hold the same components -- mirror, condenser, specimen, objective and eyepiece -- on a common optical axis, and to allow finely controlled axial movement between them. The stage supports the specimen to be examined and allows specimen movement in a plane perpendicular to a fixed optical axis. Three basic designs of microscope stand of the past 150 years. In terms of mechanical stability, the end result of this evolutionary process is the modern design in which the limb/base is a rigid fixture and all focusing actions are applied to the stage -- seen on the Olympus microscope (right) above -- a construction much better suited to supporting heavy accessory devices such as zooms, trinoculars and photomicrographic cameras. Recent microscopes incorporate the lamp into the base, enabling the instrument to be moved from one place to another without upsetting the relationship of the components, so the lamp can now be added to the list of components held in alignment by the stand. The detatchable lamp unit seen on the Olympus is now rare, except as an optional extra for less expensive microscopes sold originally with only a mirror. 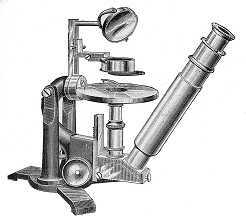 In the four hundred years of its development, the microscope has been adapted to any number of specialized tasks. The illustrations below give some idea of the variety in design. 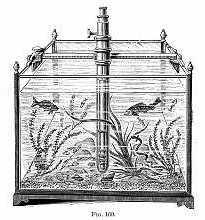 Inverted microscopes have become standard if somewhat specialized laboratory instruments, and the aquarium microscope, whilst no longer manufactured, would be sure to have a modest following if it were offered for sale today. Some unusual microscope designs of the last hundred years.